This giveaway is now closed! Stay tuned for more giveaways coming up! The salon-inspired Full Repair collection is the first weightless solution for overworked and overstyled hair. Each participant who signs up will be asked to submit a question for Harry Josh and in return will receive one full-sizeproduct from the Full Repair collection: Those with fine hair will receive a Perfect Ends Sheer Mist and participants with thick hair will receive a Perfect Ends Deep Infusion. Harry will pick a few questions submitted & answer them during the half hour live webcast and will provide a special code that participants can use to enter to win the grand prize – a trip to New York and a haircut/style with Harry! 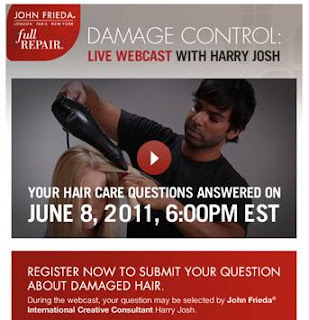 To submit your question, go to http://www.johnfrieda.com/en-S/fullrepair/Webcast.aspx or http://www.facebook.com/johnfriedaus?sk=app_217749664909710 and submit your details and any questions you would like to ask. The LIVE 30-minute interactive Webcast will happen tomorrow, (June 8th) at 6pm EST. Please note, full size product samples are done on a first come first serve basis! If you have any problems with registering, submitting questions etc, please let me know. Now, on to the giveaway on my blog! One reader of my blog will be selected to win a full set of Full Repair products from John Frieda! Products for the giveaway provided by the brand & I'm not sponsored or affiliated in any way. This giveaway is open to residents of US only(sorry, I promise I'll do an international giveaway soon!) and must be 18 and over to enter. Giveaway ends Sunday, June 12th, 2011 at 11 pm EST. I'll pick a random winner on Monday and winner will be notified via e-mail so, make sure you comment using a valid e-mail id. If the winner does not respond within 72 hours, another winner will be chosen. To enter, please leave a comment on this post(mandatory) telling me how many entries you have along with your e-mail(if your profile does not contain it that is), GFC name and Twitter name, if any. Already following via Google connect. Guess the mail ID would be there on the profile. Have never tried any john frieda product :) Maybe now is a good time! I dont know if I am following your blog, but will check now. I would love to have this giveaway! You have such a cute blog! :) Followed you on google connect! Found you through a comment on John Frieda's FB page! Hi, found you from the JohnFriedaUS Facebook page. Saw the webcast. Wish I knew about the free product for submitting a question. They didn't advertise that when I got the e-mail about the webcast. :( After watching the webcast, I want to try out the products! I should have 4 entries. GFC name is Elizabeth Chan and Twitter name is fahsum. Mhmm...that is what I thought too! Because when I submitted the question, they never asked us for the product thing! Which means they had run out by that point! Well blah! :) It is all good!